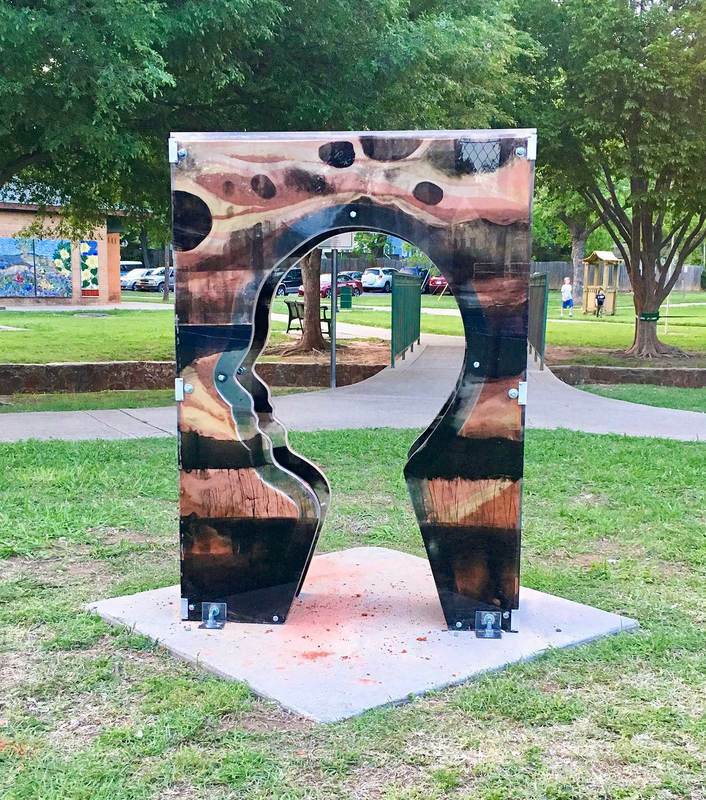 In collaboration with the Norman Art Council and the Norman Public Art Board, OU students are given the opportunity to propose sculptures to be placed in Lions Park in Norman, OK. I supervise the proposal process and students formally present their ideas to the public art board panel. Selected works are then fabricated over the course of the semester and placed in the park for 3-4 months. Many of the works are created using digitally assisted CNC technologies which the students learn as part of the building process. This project has been done in 2012, 2014, and most recently 2017. Thanks to the Norman Arts Council, the OU School of Visual Arts, and the Weitzenhoffer Family College of Fine Arts who all support this project financially. Mayumi Keifer, Friendship Bell, MFA candidate in ceramics. Wood and clay. ​Originally from Japan, Mayumi discovered that one of Norman's sister cities, Seika (Japan), is where she once lived as a small child. This sculpture is meant to help bridge the cultural gap between eastern and western traditions through friendship. Ideally, Mayumi will be able to build (or relocate) this piece in Seika during her MFA studies in order to connect the work to each culture in a meaningful way. 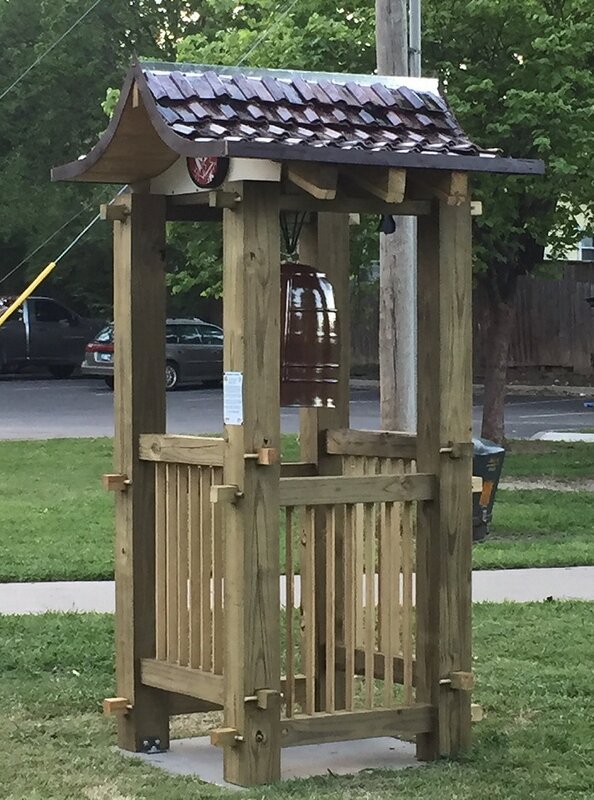 The work is interactive and the community is invited to ring the bell in a spirit of contemplation about place. Much of this structure was created using both traditional and technological means through CNC routing. 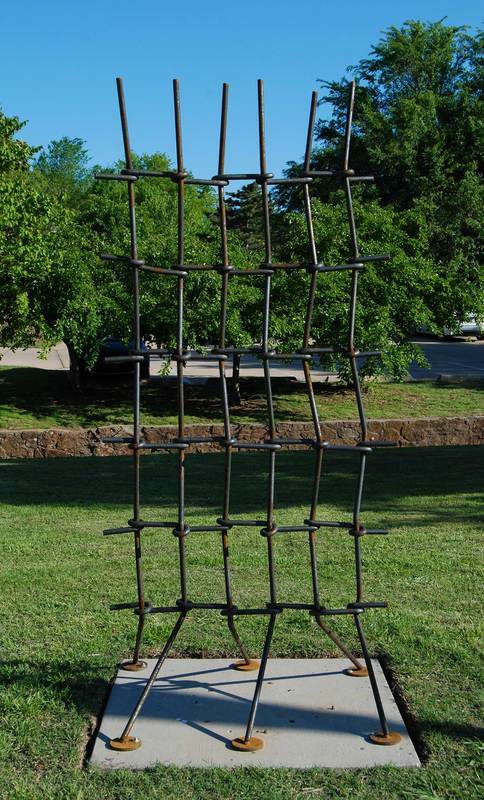 Sean Meuller, Pathway #3, MFA candidate in sculpture. CNC and welded steel. Pathway #3 represents the artist means for adjusting and learning about place. Through a number of treks on foot and on bike, Sean tries to "re-draw" his path through communities from memory and place them into various visual presentations. 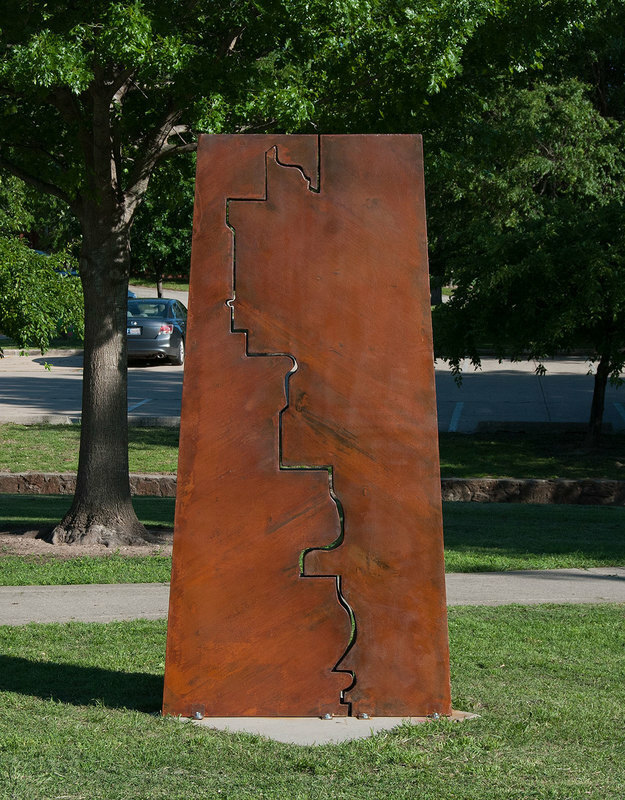 This sculpture represents the artist first trek to the park where the sculpture is now located. ​Danielle Wiegandt, Fabric of Time, MFA candidate in ceramics. Steel. A metaphoric statement, Danielle's work represents a small section of an infinite structural and philosophical notion of the concept of time. Using heat bent 3/4" solid rods, the artists energy and logic becomes a part of the overall understanding of present, past, and future. Camila Linaweaver, Duality, MFA candidate in printmaking. CNC cut acrylic, ink, aluminum and hand dyed sand. Dealing with personal connections to undocumented immigrants, Camila's work reflects the shifting landscape of identity and place related to displaced individuals trying to exist in multiple places at once. The generic human profile aims to connect to all people as they consider where they live and how there dignity is solidified. Christine Partigianoni, Bee Signal, BFA in sculpture. CNC cut welded steel, solar lights, & solar panels. 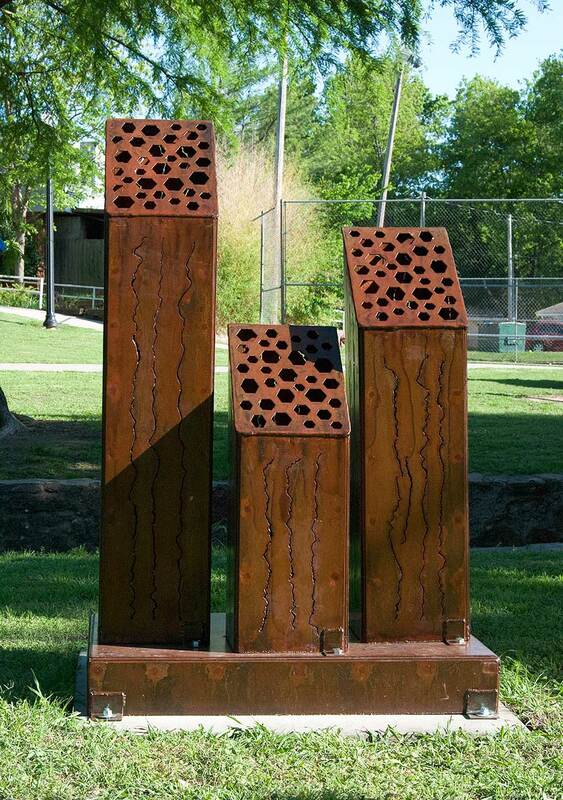 Stemming from her interests in biology and the organization of bee hives and bee behavior, the sculpture intertwines allusions to the honeycomb and the flight paths of bees. 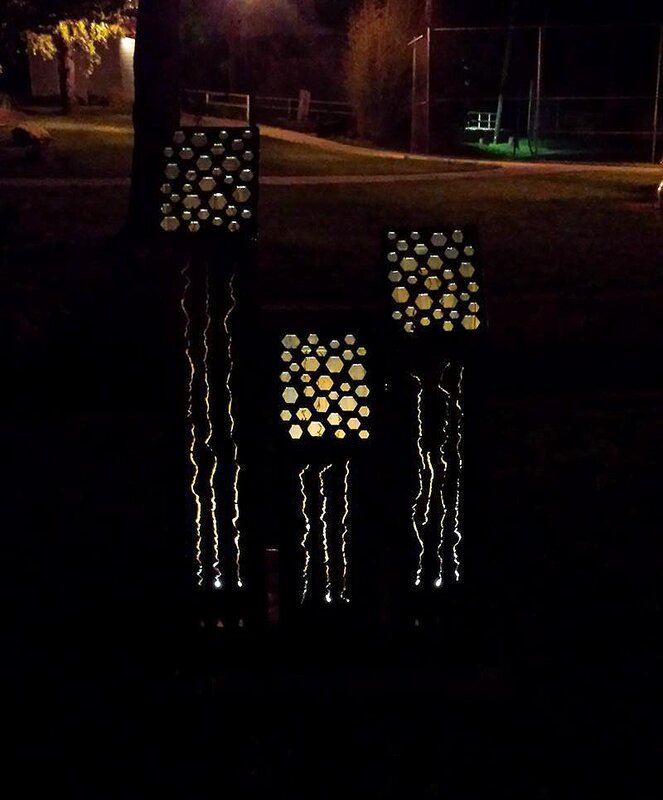 The sculpture is illuminated from within at night with embedded solar lights.